(PhysOrg.com) -- The earliest known winery has been uncovered in a cave in the mountains of Armenia. The facility, which dates back to roughly 4100 B.C.  1,000 years before the earliest comparable find  was unearthed by a team of archaeologists from Armenia, the United States and Ireland in the same mysterious Armenian cave complex where an ancient leather shoe was found, a discovery that was announced last summer. "For the first time, we have a complete archaeological picture of wine production dating back 6,100 years," said Gregory Areshian, co-director of the excavation and assistant director of UCLA's Cotsen Institute of Archaeology. An analysis of the discovery, which received support from the National Geographic Society, is presented in an article published online Jan. 11 in the peer-reviewed Journal of Archaeological Science. 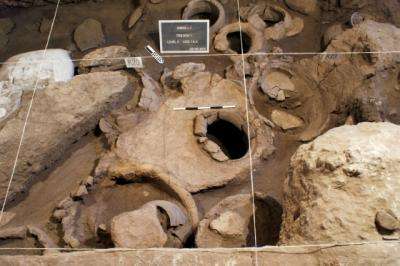 "This is, so far, the oldest relatively complete wine production facility, with its press, fermentation vats and storage jars in situ," said Hans Barnard, the article's lead author and a UCLA Cotsen Institute archaeologist. The discovery in 2007 of what appeared to be ancient grape seeds inspired the team to begin excavating Areni-1, a cave complex located in a canyon where the Little Caucasus mountains approach the northern end of the Zagros mountain range, near Armenia's southern border with Iran. The cave is outside a tiny Armenian village still known for its wine-making activities. Under Areshian and Boris Gasparyan, co-director of the project, the dig continued through September, when the vat was excavated. Radiocarbon analysis by researchers at UC Irvine and Oxford University has dated the installation and associated artifacts to between 4100 B.C. and 4000 B.C., or the Late Chalcolithic Period, also known as the Copper Age in recognition of the technological advances that paved the way for metal to replace stone tools. Archaeologists found one shallow basin made of pressed clay measuring about 3 feet by 3-and-a-half feet. Surrounded by a thick rim that would have contained juices, and positioned so as to drain into the deep vat, the basin appears to have served as a wine press. Similarly structured wine-pressing devices were in use as recently as the 19th century throughout the Mediterranean and the Caucasus, Areshian said. No evidence was found of an apparatus to smash the grapes against the wine press, but the absence does not trouble the archaeologists. This map shows the location of the Areni-1 excavation site in southeastern Armenia. Armenia is bordered to the west by Turkey; to the north by Georgia; to the east by Azerbaijan; and to the south by Iran. 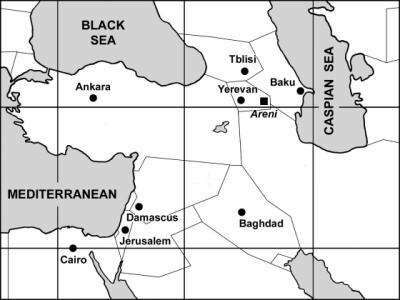 "People obviously were stomping the grapes with their feet, just the way it was done all over the Mediterranean and the way it was originally done in California," Areshian said. All around and on top of the wine press archaeologists found handfuls of grape seeds, remains of pressed grapes and grape must, and dozens of desiccated vines. After examining the seeds, paleobotanists from three separate institutions determined the species to be Vitis vinifera vinifera, the domesticated variety of grape still used to make wine. The vat, at just over 2 feet in height, would have held between 14 and 15 gallons of liquid, Areshian estimates. A dark gray layer clung to three potsherds  two of which rested on the press and the third which was still attached to the vat. Analysis of the residue by chemists at UCLA's Pasarow Mass Spectrometry Laboratory confirmed the presence of the plant pigment malvidin, which is known to appear in only one other fruit native to the area: pomegranates. "Because no remnants of pomegranates were found in the excavated area, we're confident that the vessels held something made with grape juice," Areshian said. The size of the vessel during an era that predated mechanical refrigeration by many millennia points to the likelihood that the liquid was wine, the researchers stress. "At that time, there was no way to preserve juice without fermenting it," Areshian said. "At this volume, any unfermented juice would sour immediately, so the contents almost certainly had to be wine." The team also unearthed one cylindrical cup made of some kind of animal horn and one complete drinking bowl of clay, as well as many bowl fragments. The closest comparable collection of remains was found in the late 1980s by German archaeologists in the tomb of the ancient Egyptian king Scorpion I, the researchers said. Dating to around 3150 B.C., that find consisted of grape seeds, grape skins, dried pulp and imported ceramic jars covered inside with a yellow residue chemically consistent with wine. 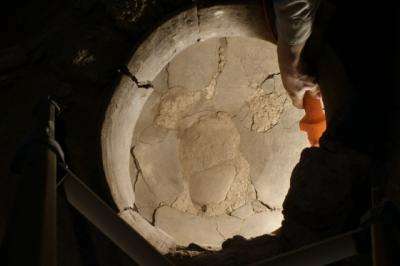 After the Areni-1 discovery, the next earliest example of an actual wine press is two and a half millennia younger: Two plaster basins that appear to have been used to press grapes between 1650 B.C. and 1550 B.C. were excavated in what is now Israel's West Bank in 1963. Over the years, archaeologists have claimed to find evidence of wine dating as far back as 6000 B.C.5500 B.C. And references to the art and craft of wringing an inebriant from grapes appear in all kinds of ancient settings. After Noah's Ark landed on Mount Ararat, for instance, the Bible says he planted a vineyard, harvested grapes, produced wine and got drunk. Ancient Egyptian murals depict details of wine-making. Whatever form it takes, early evidence of wine production provides a window into a key transition in human development, scientists say. "Deliberate fermentation of carbohydrates into alcohol has been suggested as a possible factor that prompted the domestication of wild plants and the development of ceramic technology," said Barnard, who teaches in the UCLA Department of Near Eastern Languages and Cultures. In addition to its age and wealth of wine-making elements, the Areni-1 find is notable for its numerous levels of confirmation. In a field where claims often rest on one or two sets of collaborating evidence, this find is supported by radiocarbon dating, paleobotanical analysis and a new approach to analyzing wine residue based on the presence of malvidin. Most prior claims of ancient wine have rested on the presence of tartaric acid  which is present in grapes but also, at least in some level, in many other fruits and vegetables  or on the presence of tree resins that were added to preserve the wine and improve its taste, as is done today with retsina, a wine flavored with pine resin. "Tartaric acid alone can't act as a reliable indicator for wine," Areshian said. "It is present in too many other fruits and vegetables, including hawthorn, which still is a popular fruit in the area, but also in a range of other fruits, including tamarind, star fruit and yellow plum." "Resins could indicate wine, but because they were used for a large number of other purposes, ranging from incense to glue, they also are unreliable indicators for wine," Barnard said. "Moreover, we have no idea how wide the preference for retsina-like wine spread." The beauty of malvidin, the UCLA team emphasizes, is the limited number of options for its source. The deeply red molecule gives grapes and wine their red color and makes their stains so difficult to remove. "In a context that includes elements used for wine production, malvidin is highly reliable evidence of wine," Areshian said. Areshian and Ron Pinhasi, an archaeologist at Ireland's University College Cork and a co-director of the excavation project, captured the world's imagination in June, when they announced the discovery of a single 5,500-year-old leather moccasin at the Areni-1 site. It is believed to be the oldest leather shoe ever found. The precise identity of the wine-swilling shoe-wearers remains a mystery, although they are believed to be the predecessors of the Kura-Araxes people, an early Transcaucasian group. Nevertheless, archaeologists who have been excavating the 7,500-square-foot-plus site since 2007 think they have an idea of how the wine was used. Because the press and jugs were discovered among dozens of grave sites, the archaeologists believe the wine may have played a ceremonial role. "This wine wasn't used to unwind at the end of the day," Areshian said. The archaeologists believe wine-making for day-to-day consumption would have occurred outside the cave, although they have yet to find evidence for these activities. Still, they believe it is only a matter of time before someone does. "The fact that a fully developed wine production facility seems to have been preserved at this site strongly suggests that there are older, less well-developed instances of this technology, although these have so far not been found," Barnard said. Wine With a Double Shot of Vitamin C? Wine, the fruit of the vine that gladdens the hearts of men.